Dep. Health Minister Litzman asks Health Ministry Director-General to examine possibility of making daycare conditional on vaccination. 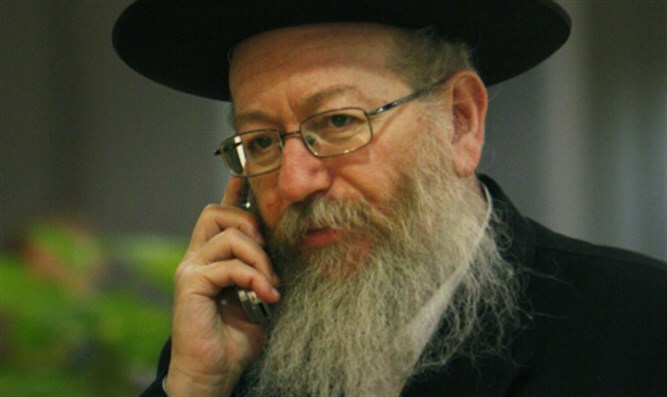 Deputy Health Minister Yakov Litzman (UTJ) on Thursday sent a letter to Health Ministry Director-General Moshe Bar Siman Tov, asking him to examine the issue of allowing unvaccinated children into school settings, Kikar Hashabbat reported. In the letter, Litzman asked Bar Siman Tov to examine the possibility of conditioning acceptance to childcare on presentation of the child's immunization record. "As is known, vaccinations are a cornerstone in preventing dangerous infectious diseases," Litzman wrote in his letter. "They definitively contribute to children's health and that of the general population. The recommended vaccinations in the State of Israel are effective and safe, and they prevent illness, disability, and death caused by infectious diseases." "Unvaccinated children are not only at higher risk of disease, but also endanger everyone around them, since they harm the 'herd immunity' and can infect others if they become ill. This risk rises when a child is in a school setting with other children, due to the [time spent in] relatively close quarters, closed areas, and children's personalities. "Israel has a relatively high vaccination rate when compared to other countries, but in recent years, there are children whose parents choose not to give them the recommended vaccinations. The efficiency of a vaccine rises with the rate of vaccination. Because of this, a drop in the number of vaccinations can cause an outbreak and harm the health of children and the public. In many countries in the world, there is a policy that unvaccinated children are not allowed to enter daycare unless they have a documented medical exemption." If approved, the new policy would force unvaccinated children without a medical exemption to receive all the necessary vaccinations prior to entering a childcare setting. Those children who were not vaccinated due to medical reasons would have to bring a letter from a qualified doctor. Last week, MK Oren Hazan (Likud) proposed a bill banning unvaccinated children from entering daycare. ""Parents who do not want to vaccinate their children should not harm public health," Hazan asserted. "I respect the freedom of choice in caring for children. The problem is that when we do not vaccinate, our children's risk of contracting unnecessary diseases and other complications increases." "Every parent knows well how in kindergarten viruses jump from one child to another, and when one has a fever the whole kindergarten is sick. When that's the case, there's no reason to take the risk with other dangerous and unnecessary illnesses."